A government watchdog organization concluded Wednesday that former Environmental Protection Agency Administrator Scott Pruitt did not violate any rules when he discussed plans to rescind a clean water regulation with an association opposed to the regulation. Last year, Pruitt appeared in a video produced by the National Cattlemen’s Beef Association, discussing a proposal to rescind the Obama administration’s 2015 Waters of the United States rule. That video directs viewers to visit the group’s website, BeefUSA.org, which encourages people to contact members of Congress to “stop EPA’s unlawful expansion” and repeal the regulation. House Democrats asked the Government Accountability Office to investigate whether Pruitt’s participation in the video constituted unlawful spending of agency funding on propaganda or grassroots lobbying. In a letter to lawmakers, GAO said Wednesday that no rules were broken. 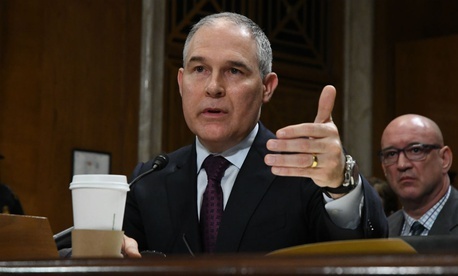 EPA officials told investigators that although funds were spent for the salaries of Pruitt and staff members while they coordinated and participated in the video interview, it was arranged to coincide with an already scheduled stop on a multi-state tour the former administrator went on to discuss the Waters of the United States rule with local officials and other stakeholders. In the video, Pruitt discusses the EPA’s reasoning for proposing to rescind the rule, and encourages the public to provide comment as part of the official rule-making process. But aside from the administrator’s appearance in the video, officials said the agency was not involved in its production. GAO said that in order for an agency to violate the prohibition on agency funds being used on “publicity or propaganda,” the communication in question must be either “self-aggrandizing, purely partisan” or “covert” in nature. Because Pruitt’s remarks stayed on policy topics strictly within the purview of the EPA administrator, he did not violate the first two categories. And the video clearly identified him as the head of the EPA, so the communication was not covert. Additionally, GAO found that while Pruitt encouraged the public to weigh in on the proposed rescission of the Waters of the United States rule, he did not violate rules against agency money being spent on “grassroots lobbying” because that provision only covers congressional activities. Although the National Cattlemen’s Beef Association includes a link to a website urging people to contact lawmakers about the Waters of the United States rule in the video, GAO found that EPA was not culpable for the group’s actions, particularly since the agency did not promote the video after it was published. In June, EPA announced that it was extending the public comment period on the proposal to repeal the Waters of the U.S. rule until August 13. The repeal is not yet finalized.